Since 1998, the IECD and its partners have implemented the Support for Small Enterprises (VSE) program, which accompanies heads of small businesses or start-up entrepreneurs in the creation, consolidation and permanence of their activity. It is now deployed in 9 countries. Salimata is one of the beneficiaries. Salimata manages a small business selling fresh eggs in the municipality of Yopougon in Ivory Coast. 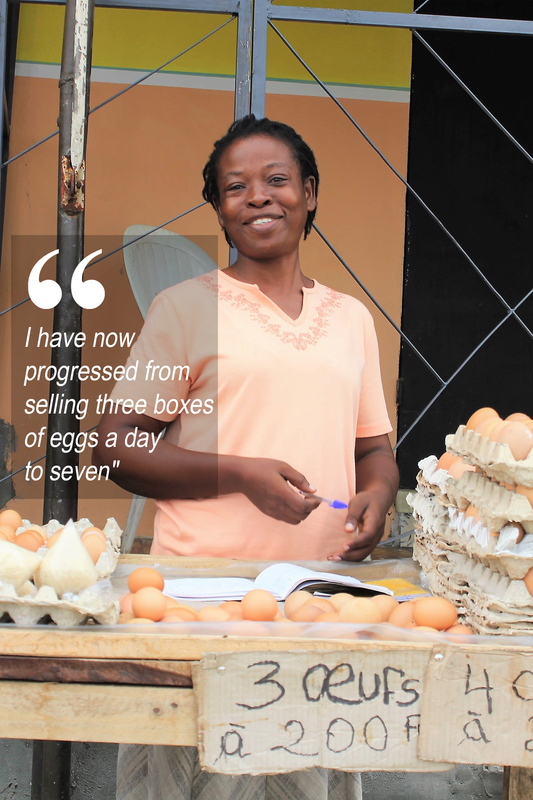 “When I started selling fresh eggs in 2016, it wasn’t easy. I had to set out very early in the morning and also take of my child and my household tasks. I became tired because of a lack of organization. After three months, I almost stopped everything because my business was not doing very well. I didn’t know exactly what I was spending or what I was earning. My encounter with Ivory Coast Enterprises Development (ICED) was decisive for taking back control of my business. It was a friend who signed me up for the Basic management training. She had followed this course shortly before. From the very first sessions, we learned how to set a goal, understand the importance of saving, cash books and customer relations.